NOTE: The Fair Chance Ordinance has been amended, effective May 14, 2018. A copy of the amended FCO is available here. Updated information on the FCO is below. On March 4, 2014, Mayor Edwin Lee signed the Fair Chance Ordinance (FCO) into law. The FCO went into effect on August 13, 2014 as Article 49 of the San Francisco Police Code. In 2018, the FCO was amended, and the amendments went into effect on May 14, 2018. The FCO regulates how conviction history can be used in some important employment and housing decisions, including hiring/starting a tenancy or termination/eviction. It applies to affordable housing providers (not private housing), employers with 5 or more employees, and city contractors who have contracted with San Francisco for $5,000 or more in services. The FCO requires that an applicant’s qualifications be determined before looking at conviction history and that applicants receive an individualized assessment of their conviction history later in the process, including how applicants have rehabilitated since their last conviction. The FCO also forbids certain questions related to your conviction history and requires a specific procedure that must be followed whenever the FCO applies. If you feel you have been denied housing or employment because of your conviction history, contact the Human Rights Commission (HRC) for housing issues, or the Office of Labor Standards Enforcement (OLSE) for employment issues. The HRC can be reached at (415) 252-2500, hrc.info@sfgov.org, or in person at 25 Van Ness Avenue, 8th Floor, San Francisco, CA 94102. You can also file an online inquiry with the HRC here. The OLSE can be reached at (415) 554-5192, fco@sfgov.org, or https://sfgov.org/olse/fair-chance-ordinance-fco. For a copy of the FAIR CHANCE ORDINANCE (Amendments effective May 14, 2018), click here. For a copy of the HRC'S FCO RULES OF PROCEDURE (How HRC investigates FCO complaints), click here. ​For answers to FREQUENTLY ASKED QUESTIONS (FAQs) ON THE FCO, click here. Have all of your other qualifications for affordable housing decided BEFORE your housing provider knows anything about your prior arrest or conviction record. Not be asked about your prior record through a rental application form. Be provided with a copy of this notice before your housing provider runs your background report. Pointing out any inaccuracies in the report. Providing evidence of rehabilitation. Evidence of rehabilitation can include satisfying parole/probation, receiving education/training, participating in alcohol/drug treatment programs, letters of recommendation, and/or the age you were convicted. Explaining any mitigating factors about the circumstances of the conviction. Mitigating factors include physical or emotional abuse, coercion, untreated abuse/mental illness that led to the conviction. Call the Human Rights Commission to understand your rights or file a complaint (within 60 days of violation) without any negative action or retaliation taken against you by your Housing Provider. Post the FCO notice prominently on their website and any location frequently visited by tenants or housing applicants. State in all advertisements that they will consider qualified applicants with conviction histories. Ensure that background checks do not contain any of the six “off-limits” categories referenced above. Conduct an individualized assessment and consider only “directly-related” convictions and unresolved arrests in light of time elapsed, any evidence of rehabilitation, mitigating factors, or inaccuracy in the report . Before taking a negative action such as A) Eviction, B) Failing or refusing to rent or lease property to an individual, C) Failing or refusing to add a household member to an existing lease, or D) Reducing any tenant subsidy, the housing provider must give the individual a copy of the background report and identify the particular convictions or unresolved arrests on which the negative action is based. Give the individual 14 days to respond orally or in writing to provide evidence of rehabilitation, mitigating factors, or inaccuracy in the report, delay any negative action for a reasonable time, and reconsider in light of the applicant’s response. Notify the individual of any final negative action. Retain tenant applications and pertinent data and records relating to this Ordinance for 3 years. Under the Fair Chance Ordinance,the HRC is responsible for publishing and making available to affordable housing providers a notice suitable for posting that informs applicants of their rights under this Article. The HRC shall make this notice available to housing providers in English, Spanish, Chinese, and Tagalog. Housing providers must prominently post on their website the HRC notice in all of the languages referenced above. Housing providers must prominently post the HRC notice in all the languages referenced above at any location under their control that is frequently visited by applicants or potential applicants for the rental or lease of affordable housing in San Francisco. To download a copy of Fair Chance Ordinance Poster including all translations, click here. To download a copy of this notice in CHINESE, click here. To download a copy of this notice in ENGLISH, click here. To download a copy of this notice in SPANISH, click here. To download a copy of this notice in TAGALOG, click here. The Fair Chance Ordinance requires the Human Rights Commission to collect FCO performance and compliance data annually. Below are links to these annual reports. HRC and the National Employment Law Project: "Fair Chance Implementation Case Studies for Government Agencies"
HRC welcomed over 100 community members to the Board Chambers for our hearing on the “Human Rights Impact of the War on Drugs.” In addition, the HRC was happy to host SF Police Chief Greg Suhr, SF Juvenile Probation Chief William Sifferman and representatives from the District Attorney’s Office, the Sheriff’s Department, and Adult Probation as our guests to the hearing. Presenters from All of Us or None, the Center for Juvenile and Criminal Justice, the National Employment Law Project, Immigrant Legal Resource Center, Center for Young Women’s Development joined Alice Huffman, California President of the NAACP in advising the commission on individual rights impacted by the War on Drugs and making recommendations increase public safety and reinstitute those rights. In addition, more than 30 members of the public provided testimony on how the War on Drugs has impacted their rights and their communities. The third event in the Second Chance Legal Clinic's "Policing in Communities of Color Discussion Series," this event addressed how the War on Drugs has shaped policing practices in communities of color. Panelists discussed: racial profiling in drug arrests and convictions; the impact of drug criminalization on low income communities of color; and the need for reform in drug law enforcement. Click here for event details. 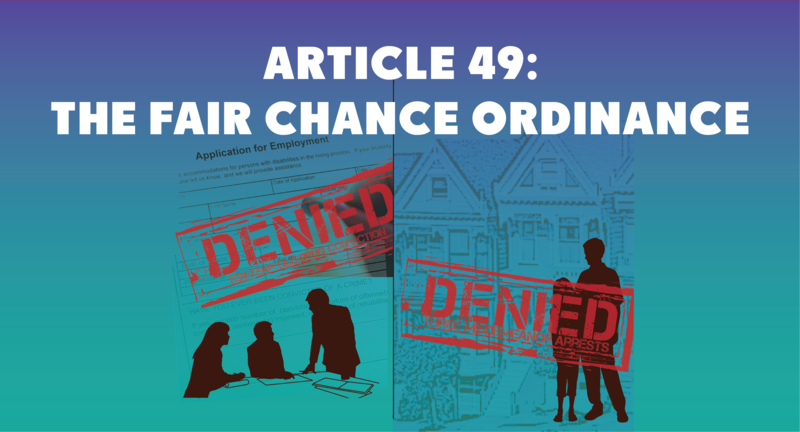 For more information about the Fair Chance Ordinance and the HRC's implementation of the Ordinance, please contact Noah Frigault, Senior Policy Analyst, at noah.frigault@sfgov.org.